(image courtesy of Grapevine Craft Brewery). 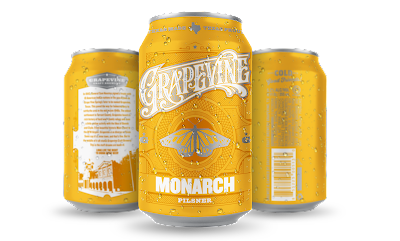 Once marketed as "a wheat beer that drinks like a pilsner," Grapevine Craft Brewery has announced that from this point on, the company's Monarch brand will be brewed to match that traditional German style. Monarch debuted along with the brewery in late 2014 as one of Grapevine's year-round brews, but being a filtered wheat beer, research suggested it caused confusion for consumers who expected something more along the lines of a German hefeweizen (a style characterized by its banana and clove flavors, cloudy appearance and fuller body) . In addition, despite being billed as the brewery's lighter, more sessionable option among its core lineup, some tended to shy away from the beer because it was brewed with wheat. With that in mind, Grapevine decided it was time to make a change to the beer's recipe, while still maintaining the brand identity it had built around Monarch. Thus, a pilsner was born. As brewery owner Gary Humble explains, "We've been asked why we are still calling the beer Monarch and not changing the brand. The beer we're making today is the beer that we've been working towards for a long time. While much has changed in how we make the beer...we feel it's a more honest approach to the way we portray the brand. We know that fans of Monarch are going to love this beer, at least we're certainly counting on it." According to a press release, the new Monarch Pilsner will hit draft accounts around March 1, with cans appearing on retail shelves beginning March 14.